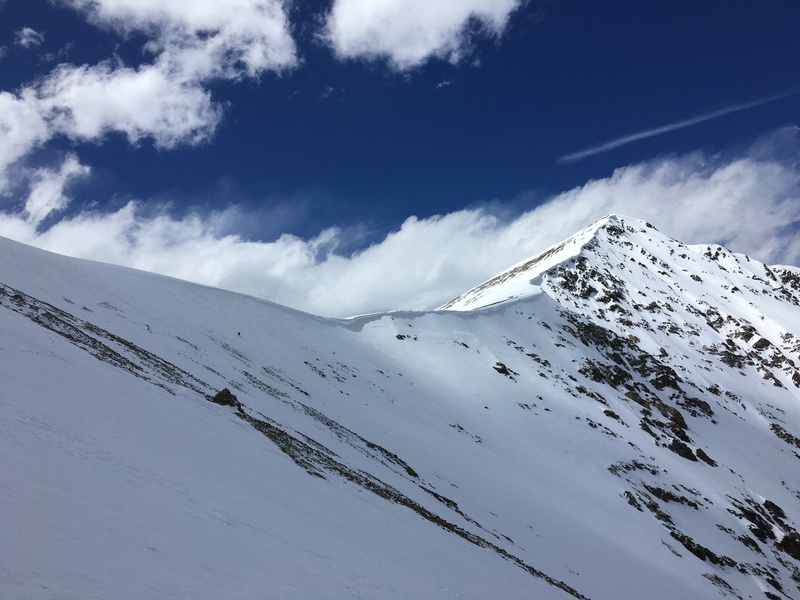 Torreys Peak and Kelso Ridge in it’s entirety as seen on the approach. Let’s battle. Stevens Gulch, caked. Winter uniform, check. If you’re wondering, Mat is the Ohio State alum and I am the Penn State alum. The title in it’s entirety would actually go something like, “An Ohio State alum and a Penn State alum walk into a bar. Which one has a job?”. The joke was funnier on the approach before Mat finally landed a job a few weeks ago. No more Ohio State jokes. Penn State jokes are too easy. I get it. 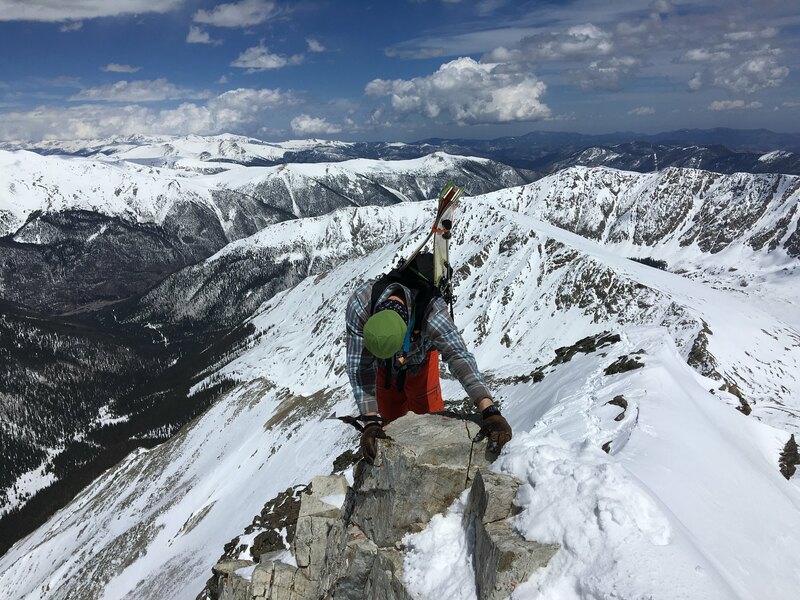 Mat gaining the Torreys/Kelso saddle (12,380′). The lower portion of the route. Photo by Mat. 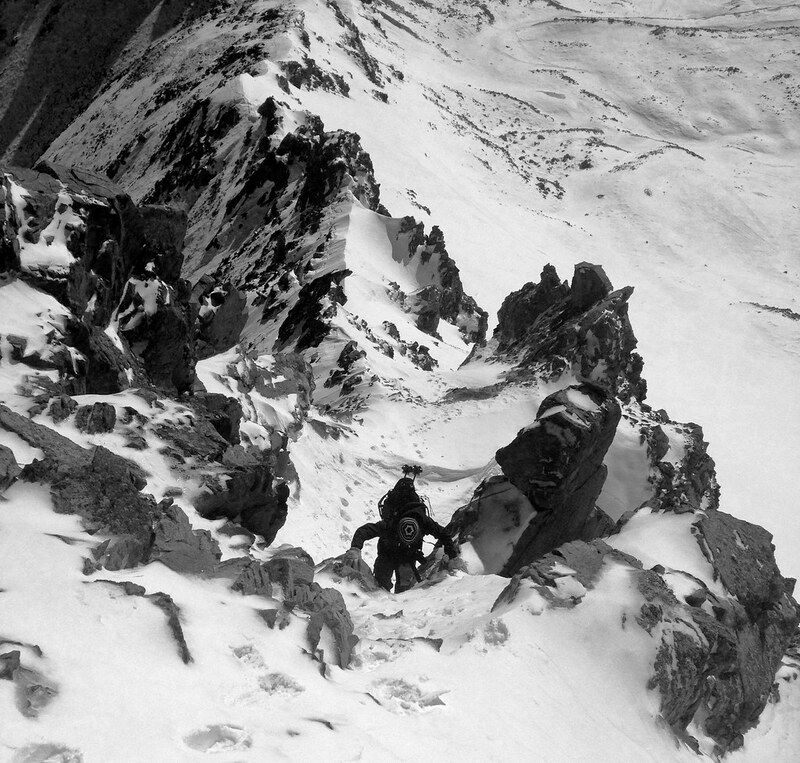 Beginning the initial ascent of the ridge. There’s plenty of beta over on the .com, so I’ll leave the specifics to the experts and let these pictures add some reference. 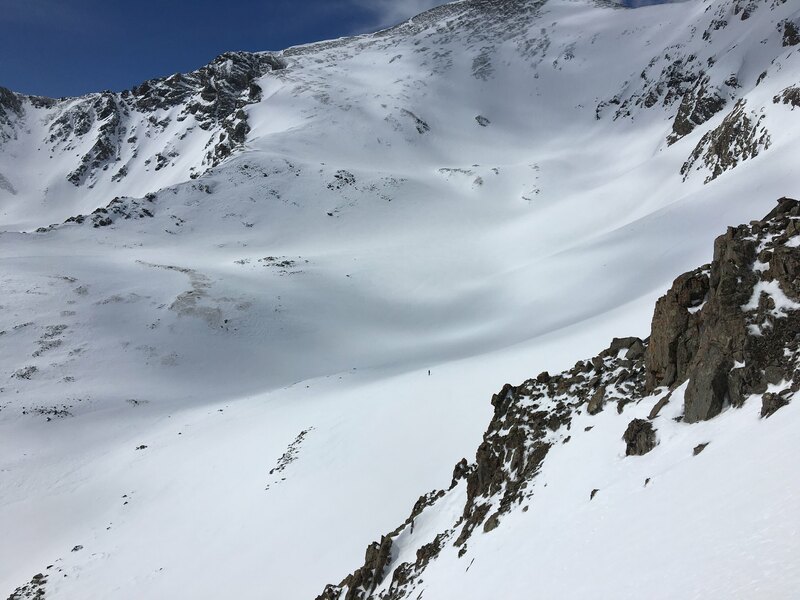 Hard to see, but the human in the center of this picture we believe is Jon Kedrowski, after descending Dead Dog that morning. I’ll save that sh#t storm for the forum. 🙂 No comment. A few hundred feet above the previous photo. Ascending one of the steeper sections. I’m gonna need more coffee. Hey Mat, that’s a line from the Martian. Photo by Mat. Mat doing a little recon. Ski boots. Unfair advantage. Somewhere around here it was decided that if you ever get the song Higher by Creed stuck in your head in the hills you might as well just call it a day and go home. Patent that left handed snow punch technique. Photo by Mat. Money shot. Mat, god put that rock there for a purpose and I’m not so sure you should move it. Maneuvering the short knife edge. 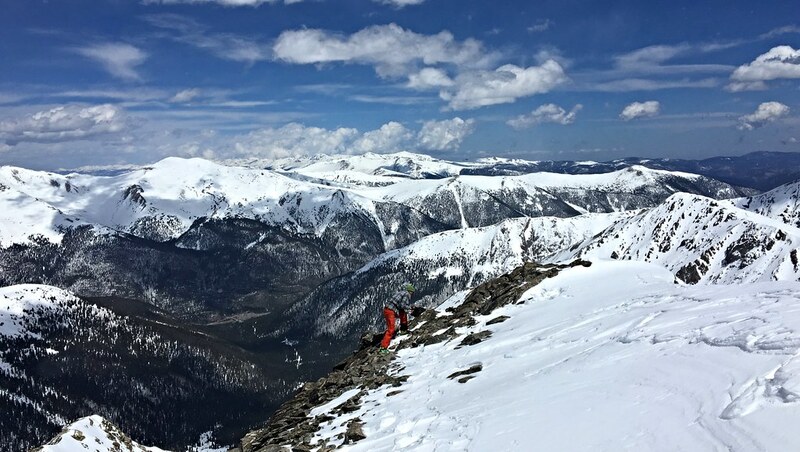 Having never done this route in summer, I can’t really talk specifics on the pros and cons of hitting it with snow vs. it being dry. 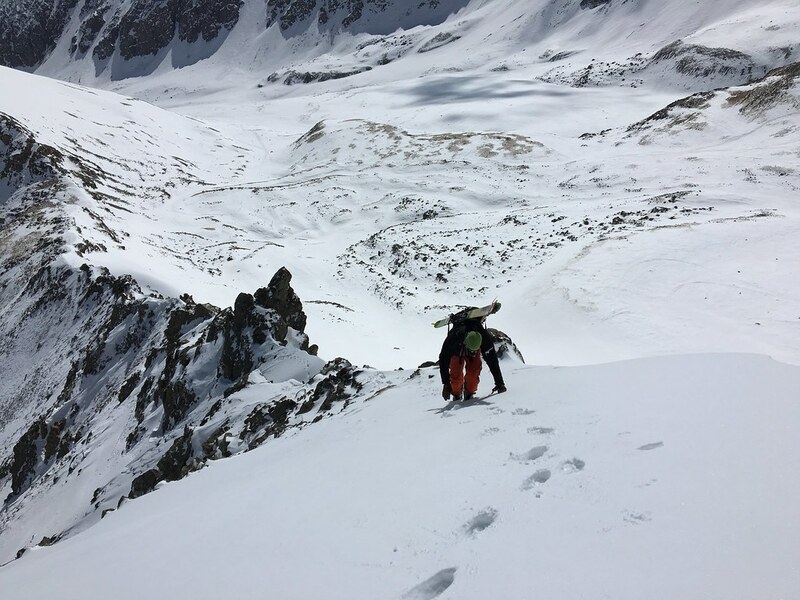 Like anything else, I’m sure there are a few sections of the Class 3 scrambling where bootpacking up the snow is easier and safer, while ice may make a few other sections a little more difficult. On this day we were happy for the snow, and lots of it. Neckbreaker? “Dillon, I think your using that word wrong”. 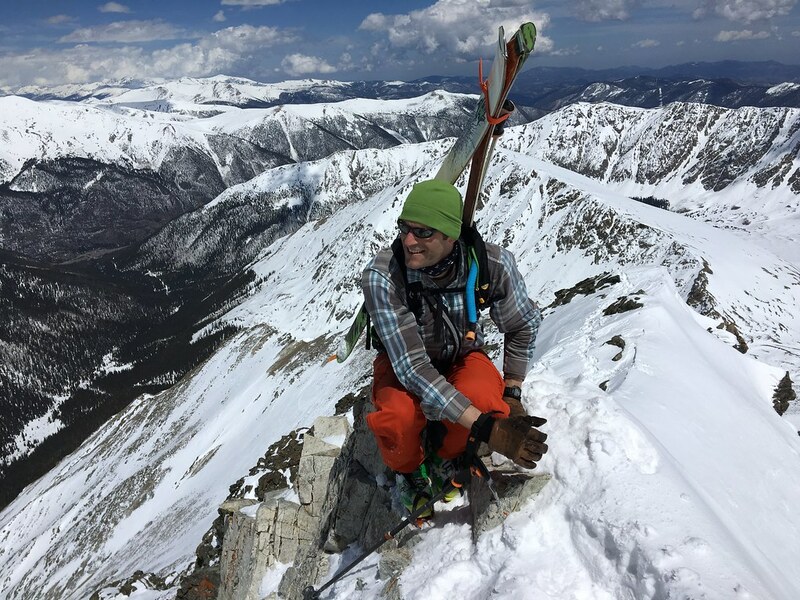 Lou Dawson says, “Having skis on your back would be dangerous while scrambling up this steep terrain”. Mat might agree. Nah, easy peasy. The big man is all smiles after that maneuver. Did I mention this dude drives a Prius. 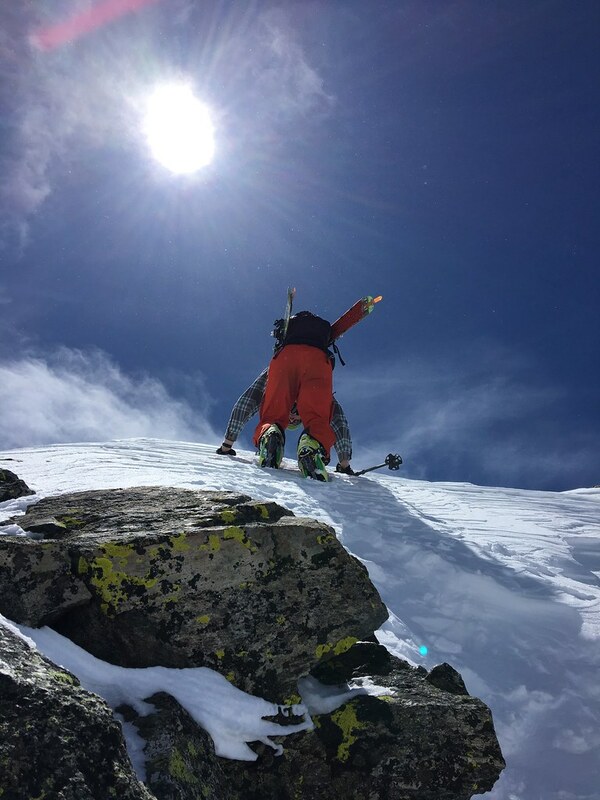 Final summit push. Photo by Mat. 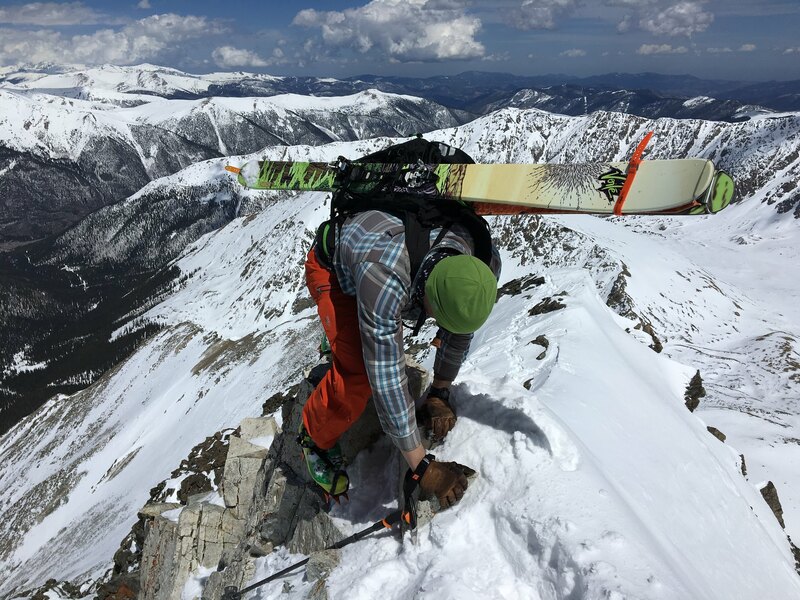 Initially the game plan was for me to descend the G&T saddle, while Mat skied Dead Dog, but after talking it over on the summit and with it being later in the day than anticipated, we both headed for the saddle. I got a head start down while Mat sat back and found a good spot to drop in. 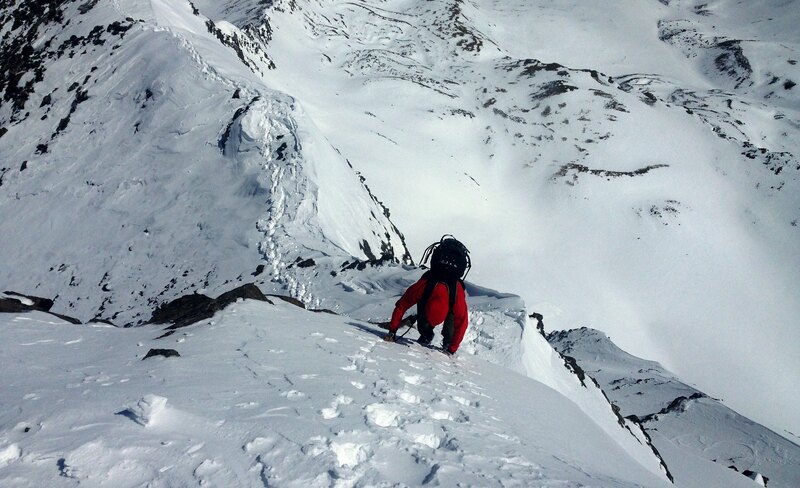 Mat skiing off the G and T saddle (upper left just below the saddle). Click to zoom. 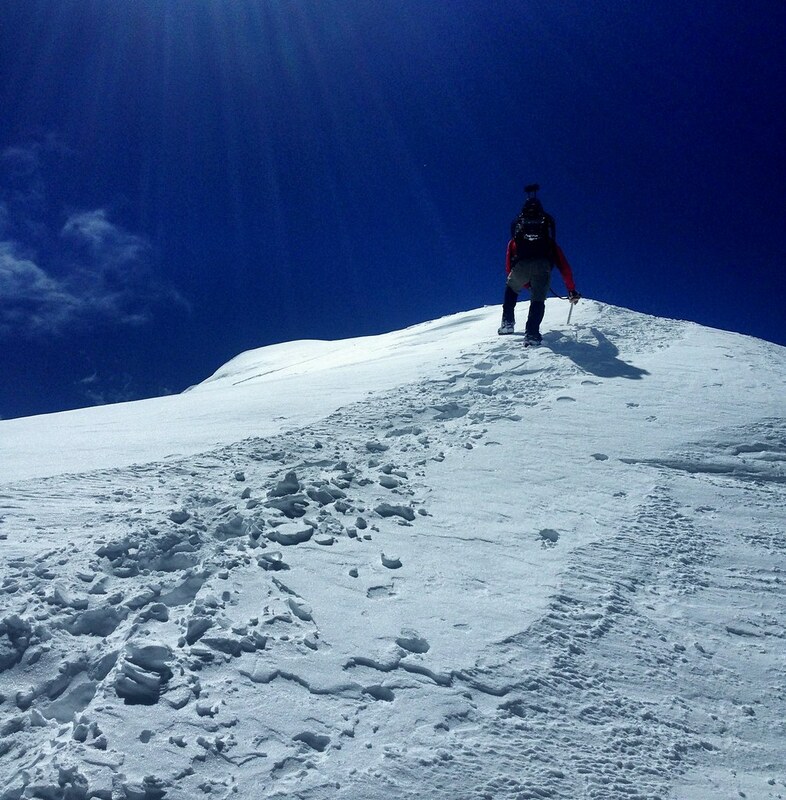 We then rendezvoused in the basin below the saddle before Mat skied off into the abyss. 5 miles and an hour behind I arrived at the car just off I-70, wet, sunburned and thirsty. Both chairs out, Mat lounging in one, ice cold Happy Camper in hand, with another on deck for me. Some quick but quality daydrinking ensued. It was a fitting end to a solid day in the mountains. 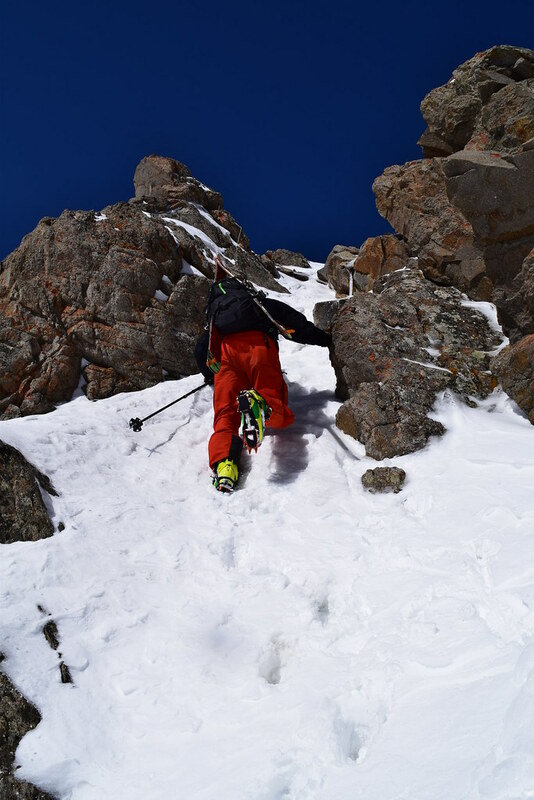 Not to mention, Mat had just skied to within 10 feet of the car from the saddle. Chalk that one up in the win column. 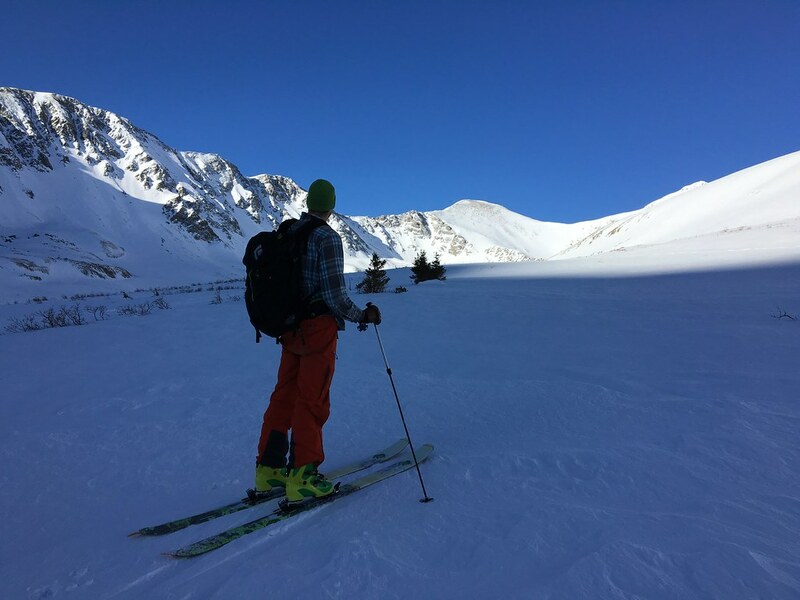 Lessons learned: Skiers and snowshoers can still coexist, the winter TH adds 6 miles and 1,400 vert, that shady dude who parks next to you in the big empty parking lot and never gets out of the car is probably going to eventually chop you up, and don’t bring Mat a coffee in the morning… Ever. Thanks for a great day out there buddy. Bring on summer! Cheers and thanks for reading all! Awesome TR, buddy, and great pics! 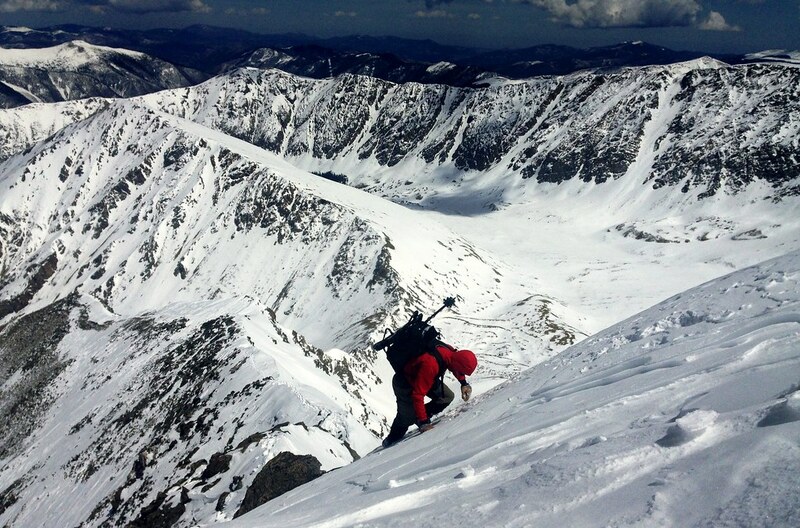 Love the ones showing the steep snow climbing. That is a great route. I did that one one early March years ago. And, for the record, I did used to listen to Creed circa 2001-2002 in graduate school down in Hotlanta 🙂 I dug it at the time. Haha. Tell sawyer no after party in my house this weekend. Don’t get too crazy. You’re old!! I’ll catch ya on the flip side soon.